To Cite: Mousapour E, Mahfuzi M S, Hoseini M, Mousapour P. Comparison of Complications and Surgical Outcomes of Percutaneous Nephrolithotomy with and Without Nephrostomy: A Double-Blind Randomized Controlled Trial, Jentashapir J Health Res. 2017 ; 8(4):e58328. doi: 10.5812/jjhr.58328. Background: Percutaneous nephrolithotomy (PCNL) has been established as a minimally invasive treatment option for removal of kidney stones. The aim of this research was to compare complications and surgical outcomes of standard PCNL with tubeless PCNL. Methods: In this double-blind randomized controlled trial, 50 consecutive patients with kidney stone were randomly assigned to intervention and control groups. In the control group, a nephrostomy was placed at the end of PCNL and in the intervention group, nephrostomy was omitted. Incidence of fever, hospital stay, analgesic requirement, blood transfusion, urinary leakage, and patient’s satisfaction were compared between the 2 groups. Results: Pain score was significantly lower in the tubeless group in comparison with the control group (P < 0.001). Analgesic use among patients of the tubeless PCNL group was significantly lower than the control group (P value < 0.02). Eight percent of the control group and 20% of the intervention group had a transient fever (P value < 0.05). Hemoglobin levels did not show any significant difference between the 2 groups (P value > 0.78). The number of patients with “low urine leakage” was significantly higher in the tubeless group than in the control group (P < 0.002). Hospital stay was significantly lower while patient satisfaction was significantly higher in patients, who underwent tubeless PCNL in comparison with the control group (P < 0.02). Conclusions: The evidence from this study provides some support for application of tubeless percutaneous nephrolithotomy for patients with renal stone, regardless of the stone size and type. Prevalence of kidney stone has increased worldwide (1). With the popularity of percutaneous renal surgeries in the past 2 decades, percutaneous nephrolithotomy (PCNL) is now considered the gold standard surgical technique for the treatment of large renal stones (2, 3). Based on the current Cochrane review, PCNL is more effective than other less aggressive techniques, such as extracorporeal shock wave lithotripsy (ESWL) (2). Furthermore, PCNL is a the procedure of choice for patients with large kidney and upper ureteral stones and it has the greatest success rate for the treatment of large renal stones. Drainage of the kidney, using a 20- to 24-Fr nephrostomy tube is the usual recommendation at the end of the operation to reduce post-operative bleeding; however, there is no strong consensus in this regard and some authors recommend avoidance of a nephrostomy tube placement in cases with small stone burden without a residual stone. These authors claim that post-operative pain and hospital stay would be decreased with this technique, while blood loss would not change significantly (4). Safety and feasibility of this technique has been proved for elderly patients without major intra-operative bleeding (5, 6). To the best of the author’s knowledge, there is no controlled blind study comparing standard PCNL with tubeless PCNL. The purpose of this study was to compare post-operative pain, urinary leakage, hospital stay, and blood loss among patients with and without nephrostomy placement after standard fluoroscopic supine position PCNL. For this double-blind randomized controlled trial, 50 consecutive patients, who were candidates for PCNL at the Golestan hospital, Ahvaz, Iran were enrolled. Exclusion criteria were poor performance status, simultaneous ureteral stone, age below 18 or more than 70, perforation of pyelocalyceal system, major hepatic or cardiac dysfunction, atrioventricular cardiac block, and opium addiction. Participants were randomly allocated to 2 groups using a computer-based randomization program (n = 25 in each group) (Figure 1). This was a double-blind study, in which participants and outcome assessors were blinded yet blinding of investigators could not be achieved due to the nature of the interventions. Patients were randomly assigned to the control group (with a 20-Fr nephrostomy tube) or intervention group (without nephrostomy tube). Percutaneous nephrolithotomy was performed under general anesthesia by the same surgeon and the anesthetist and all of the patients had ureteral 5-Fr stent at the end of the operation. The primary outcome of this study was post-operative pain, which was measured 24 hours after the surgical procedure, using the visual analogue (VAS) scale. As secondary outcomes, fever, blood loss (g/dL hemoglobin before and after the procedure), and urine leakage were also evaluated. Regarding urine leakage, patients were categorized to one of the following groups: high leakage (extra ordinary, which needed secondary operation), moderate leakage (needed daily dressing change because of urinary leakage), and low leakage (no urinary leakage or does not need dressing change during admission). Hospital stay, analgesic requirements after surgery, and patients’ satisfaction with the surgery were also assessed. Based on a previous study (6), sample size was calculated as 25 for each group (Power = 80% and α = 5%). This study was conducted under supervision of the ethical committee of Ahvaz Jundishapur University of Medical Sciences (Ref No. IR.AJUMS.REC.1395.582). The study protocol conformed to the ethical guidelines of the 2008 declaration of Helsinki and it has been registered at the Iranian registry of clinical trials (IRCT2017041033343N1). Informed written consents were obtained from all participants. All statistical analyses were performed using the SPSS version 22 software. All main outcomes are presented as mean (SD) and frequency (%) for continuous and categorical variables, respectively. Statistical significance level was set at a two-tailed type I error of 0.05, and deviation from normal distribution was examined by calculating skewness and by the Kolmogorov-Smirnov test. Chi-square test, paired-t-test, and independent t-test were used to evaluate categorical variables, comparison within groups and between groups, respectively. Table 1 shows the patient characteristics in the intervention and control groups. The Clinical data of participants and surgical outcomes of the 2 groups are listed in Table 2. Comparison of surgical outcomes of the intervention and control groups at 24 hours did not show any significant difference in hemorrhage yet pain score and analgesic use in the intervention group was significantly lower than the control group. The present study was a double-blind randomized controlled trial, which was designed to compare post-operative complications and outcomes of PCNL, with and without nephrostomy tube. The results of this study indicate that pain score is significantly decreased in the tubeless PCNL in comparison to standard PCNL (P value < 0.001). Also, analgesic use during this procedure is significantly lower when the nephrostomy tube is omitted (P value < 0.02). Lower pain complaint in this group might be the reason for greater patient satisfaction after surgery (P value < 0.001). In a trial on 35 patients with simple, isolated renal pelvis or lower pole calyceal stones and no significant hydronephrosis, the mean postoperative analgesic requirement was significantly lower in the tubeless group in comparison with standard PCNL (7), which is in line with the current results. Karami et al. (2004) evaluated tubeless PCNL and demonstrated that this method is safe and feasible in patients during their sixties. In their study, analgesia requirement was reduced using the tubeless approach (P < 0.01) (8). In their study, the mean age of patients was 67.7 years and in the current study, the mean age was 47.3 years, yet the current results are in line with their results. In a trial by Cormio et al., the relationship between nephrostomy tube size and outcomes of percutaneous nephrolithotomy was investigated and the authors concluded that application of nephrostomy tube size > 18 Fr in comparison with nephrostomy tube size ≤ 18 Fr, would significantly decrease overall complication rate (hemorrhage and fever) (9). Another study with the aim of evaluation of the requirement for routine placement of a ureteral stent and a nephrostomy tube following PCNL was performed on 43 patients. The researchers claimed that there were no significant complications and analgesia requirement after surgeries in the tubeless group (in comparison to standard PCNL) and patients in this group could return to their normal activities faster (10). These findings proved further support for the current results. Omitting the percutaneous nephrostomy tube and removing ureteral catheter at the end of surgery in Gholamrezaie et al.’s and Malcolm et al.’s study was proved to reduce postoperative discomfort, the length of hospitalization, and analgesic requirements (8, 11). The current findings are in agreement with these results. The current study found that 8% of people in the control group and 20% of the intervention group had transient fever and this difference was significant (P value < 0.05). In Kara’s study, fever was seen in 6.6% of patients in the tubeless PCNL group and 10% of patients in the standard PCNL group (this difference was not significant) (8). Changes in serum hemoglobin levels, as an indicator of hemorrhage, did not show any significant difference between the 2 groups of the study (P value > 0.78). The findings of the current study are consistent with those of Istanbulluoglu (2010), who found no significant difference in serum hemoglobin changes between totally tubeless, tubeless, and standard PCNL groups, and the researcher concluded that the tubeless approach is safe for patients with no major intraoperative hemorrhage and calyceal perforation. In another study on 25 patients, the results showed that tubeless PCNL makes no significant difference in hemorrhage and hemoglobin and serum parameters in comparison to standard PCNL (12). This result is also in accordance with the current observations. In the current study, the number of patients with “low urine leakage” in the tubeless group was significantly higher than the control group (P < 0.002). However; this result has not been previously described by researchers and in Bhangu et al.’s study (2017), which was very similar to the current study, none of the patients had urine leakage from the skin wound after surgery (4). Hospital stay in patients, who underwent tubeless PCNL, was significantly lower than those in the control group (P < 0.02). In Kara’s (2004) and Tefekli’s study (2007) hospitalization time in patients, who underwent tubeless PCNL was reduced compared to standard PCNL (1.5 versus 3.2 days, P value < 0.001). The findings of this study have a number of important implications for future practice. These findings do not support strong recommendations to omit the nephrostomy tube for all patients and the decision should be taken with caution based on the surgeons expert opinion and patient’s condition during the surgery. This paper was part of a thesis for post-doctoral degree in urology (Project code: NRC-9418). Financial support for this study was provided by Ahvaz Jundishapur University of Medical Sciences. The authors sincerely thank the patients, who cooperated in this project and supported the research team and also Mahdis Vakili (MSc., Iran) for preparing and editing this article. Conflict of Interest: All authors affirm that there were no conflicts of interest. 1. Tasian GE, Ross ME, Song L, Sas DJ, Keren R, Denburg MR, et al. Annual Incidence of Nephrolithiasis among Children and Adults in South Carolina from 1997 to 2012. Clin J Am Soc Nephrol. 2016;11(3):488-96. doi: 10.2215/CJN.07610715. [PubMed: 26769765]. 2. Srisubat A, Potisat S, Lojanapiwat B, Setthawong V, Laopaiboon M. Cochrane Database of Systematic Reviews. Extracorporeal shock wave lithotripsy (ESWL) versus percutaneous nephrolithotomy (PCNL) or retrograde intrarenal surgery (RIRS) for kidney stones. In: Srisubat A, editor. Chichester, UK: John Wiley & Sons, Ltd; 2014. doi: 10.1002/14651858.CD007044.pub3. 3. Jayram G, Matlaga BR. Contemporary practice patterns associated with percutaneous nephrolithotomy among certifying urologists. J Endourol. 2014;28(11):1304-7. doi: 10.1089/end.2014.0465. [PubMed: 25036914]. 4. Bhangu GS, Darpan D, Avreen S, Nachiketa V, Shivam P, Sharma K. Totally tubeless percutaneous nephrolithotomy: one year single institute prospective study. Int J Surg. 2017;4(1):224-8. doi: 10.18203/2349-2902.isj20164063. 5. Kara C, Resorlu B, Bayindir M, Unsal A. A randomized comparison of totally tubeless and standard percutaneous nephrolithotomy in elderly patients. Urology. 2010;76(2):289-93. doi: 10.1016/j.urology.2009.11.077. 6. Istanbulluoglu MO, Cicek T, Ozturk B, Gonen M, Ozkardes H. Percutaneous nephrolithotomy: nephrostomy or tubeless or totally tubeless? Urology. 2010;75(5):1043-6. doi: 10.1016/j.urology.2009.06.104. [PubMed: 19854490]. 7. Tefekli A, Altunrende F, Tepeler K, Tas A, Aydin S, Muslumanoglu AY. Tubeless percutaneous nephrolithotomy in selected patients: a prospective randomized comparison. Int Urol Nephrol. 2007;39(1):57-63. doi: 10.1007/s11255-006-9040-6. [PubMed: 17171416]. 8. Karami H, Gholamrezaie HR. Totally tubeless percutaneous nephrolithotomy in selected patients. J Endourol. 2004;18(5):475-6. doi: 10.1089/0892779041271580. [PubMed: 15253824]. 9. Cormio L, Preminger G, Saussine C, Buchholz NP, Zhang X, Walfridsson H, et al. Nephrostomy in percutaneous nephrolithotomy (PCNL): does nephrostomy tube size matter? Results from the Global PCNL Study from the Clinical Research Office Endourology Society. World J Urol. 2013;31(6):1563-8. doi: 10.1007/s00345-012-0969-z. [PubMed: 23073656]. 10. Aghamir SM, Hosseini SR, Gooran S. Totally tubeless percutaneous nephrolithotomy. J Endourol. 2004;18(7):647-8. doi: 10.1089/end.2004.18.647. [PubMed: 15597653]. 11. Malcolm JB, Derweesh IH, Brightbill EK, Mehrazin R, DiBlasio CJ, Wake RW. Tubeless percutaneous nephrolithotomy for complex renal stone disease: single center experience. Can J Urol. 2008;15(3):4072-6. discussion 4076-7. [PubMed: 18570711]. 12. Crook TJ, Lockyer CR, Keoghane SR, Walmsley BH. 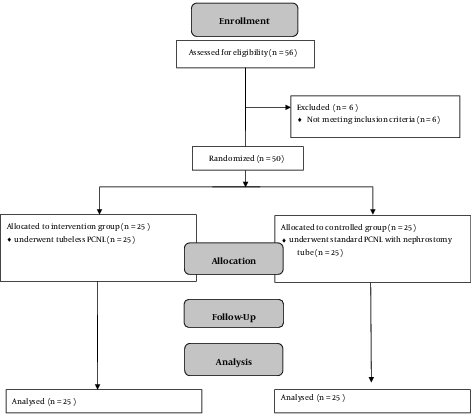 A randomized controlled trial of nephrostomy placement versus tubeless percutaneous nephrolithotomy. J Urol. 2008;180(2):612-4. doi: 10.1016/j.juro.2008.04.020. [PubMed: 18554657].